View the entire table of contents for the May 15, 1995 issue. May 15, 1995 Grapevine Wines from Spain director Louis Broman died on March 27 after a long battle with AIDS. He was 38. Broman's life was dedicated to educating Americans about Spanish wines. From 1987 until very recently, he was an active lecturer on Sherry and other Spanish wines. 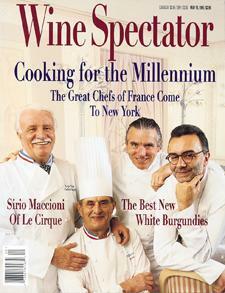 For the full article, check out the new issue of Wine Spectator, on newsstands May 15, 1995. DRC Releases Its Worst Vintage Since 1983: The 1992 reds are surprisingly weak given that the domaine reported low yields.